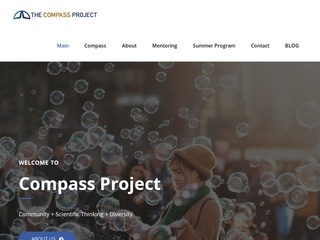 The Compass Project is a self-formed group of graduate and undergraduate students in the physical sciences at UC Berkeley. Our goals are to improve undergraduate physics education, provide our participants with opportunities for professional development, and increase retention of students, especially those from populations typically underrepresented in the physical sciences. Compass fosters a diverse, collaborative student community by providing a wide range of services, including a summer program, fall and spring semester courses, mentoring, a research lecture series, transfer student programs, and other academic and social support. Our efforts have been recognized by the American Physical Society, who presented Compass with the 2012 Award for Improving Undergraduate Physics Education. I am a first year undergraduate at UC Berkeley. My major is Nuclear Engineering with a minor in Mechanical Engineering. As of now, I am planning on working in industry for a few years after I graduate with my Bachelor’s, then hopefully come back and pursue my Master’s degree in Nuclear Engineering. I chose Nuclear Engineering because I absolutely fell in love when I learned about nuclear physics in high school. Being part of Compass and other groups such as Hispanic Engineers and Scientists has made me truly feel welcomed into Berkeley. My name is Donez Horton-Bailey, and I am a second year PhD student in Physics at UC Berkeley. I went to UC Santa Cruz for bachelor’s degrees in Applied Physics and Linguistics. During my time there and for three years after graduation I worked for the Academic Excellence (ACE) Program, whose mission is to increase the diversity of students graduating with bachelor’s degrees in STEM. After my time with the ACE Program, I started graduate school at UC Berkeley to study experimental condensed matter and materials physics. Working with the Berkeley Compass Project and the Access Network has given me the opportunity to work making higher education accessible to all alongside pursuing my doctorate degree. In my free time I enjoy studying foreign languages as well as playing bassoon in various music ensembles.